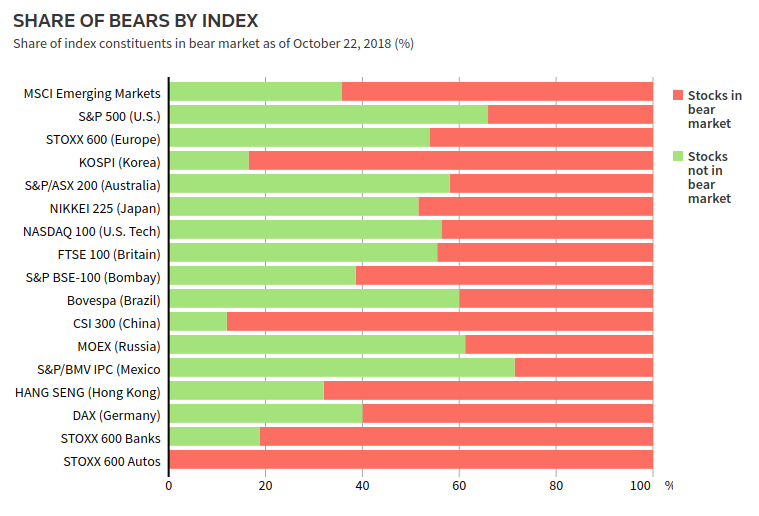 The signs of a looming bear market around the world as can be seen from the (Reuters) charts below are increasingly becoming ominous, though US still remains the best performing market despite the NASDAQ index entering correction territory on October 24, 2018. Global trade (US v. China) and geopolitical (US v. Iran and US and West v. Saudi Arabia) tensions which have made the oil price volatile with Brent and WTI crude first rising and then falling over global growth concerns and promises by Saudi Arabia to make up for the loss of Iranian oil from November after US sanctions on Iran once again kick-in, rising US interest rates and the public complaints by Trump against the US Federal Reserve over them, and the effect of rising US interest rates on emerging markets are all weighing on the minds of financial market participants. The Indian financial markets will continue to react to global growth concerns first voiced at the International Monetary Fund (IMF) – World Bank meetings by the IMF in Bali, oil price, rupee, global cues on interest rates, and stabilization of the non-bank financial companies (NBFCs). 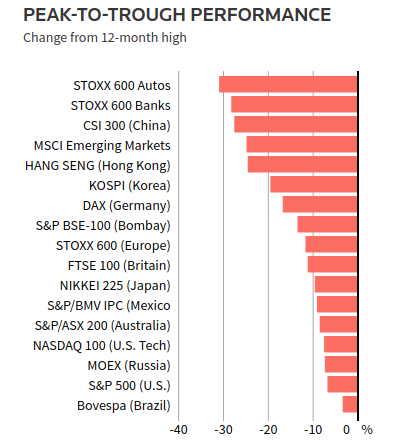 This year, thus far, as we have predicted, given the domestic macro and sectoral situation and external environment, the Indian markets have sharply corrected down. We expect this downward pressure to remain especially given the external environment. If corporate earnings for the July-September quarter are strong, they could act to offset the downward pressure on the markets to some extent, otherwise, there is a risk that Indian financial market indices could enter bear territory if they fall more than 20% from their 52-week highs having already fallen about 14%.